Tonight I was inspired by a coleslaw I spotted somewhere... Coleslaw used to be one of my favourites to make - loaded with Hellmann's, cheese, red onions and parsley as well obviously as the prerequisite carrot and cabbage. Having got no cabbage in the house, no longer (or more rarely anyway) partaking in onions, and I'm sure by now I need not explain the cheese and mayo bit... It's not something I've made for a while. But after tonight I think I may do so again soon. It seemed I'd got a little over enthusiastic with the Riverford order and seemed to have a few beetroot left over from the week when the new batch turned up, so what to do. Juice? Too lazy to clear it up (I juice on a morning generally), Roast? I generally don't cook for me. Give away? C'mon, I'm from Yorkshire! Since I discovered the processor has a grater tool I've not looked back but hand grating would do just as well. 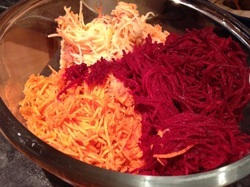 Grate all the veg/fruit and mix together well. Top with the seeds. I made it for an accompaniment to a meal but in the end was feeling like a simple dinner and just had this for myself instead of making other foods and saving the rest of this for another day. I loved the simplicity - and taste.